Do you want a simple and fast touch screen that makes it easier to control your office lighting, electronics and intercom system? 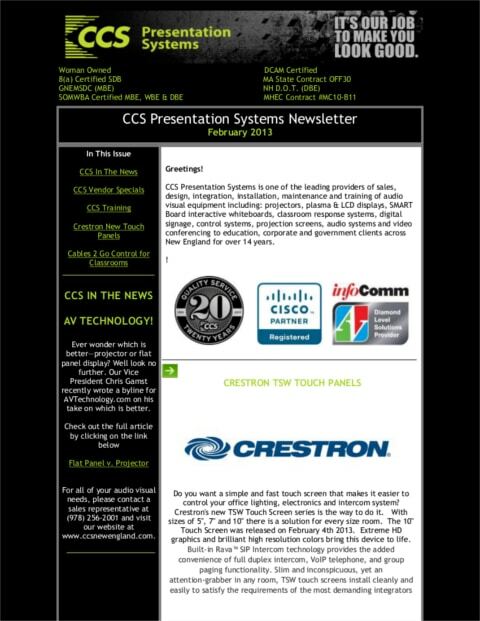 Crestron’s new TSW Touch Screen series is the way to do it. With sizes of 5″, 7″ and 10″ there is a solution for every size room. The 10″ Touch Screen was released on February 4th 2013. Extreme HD graphics and brilliant high resolution colors bring this device to life. Send HDMI plus audio and control up to 100 meters over a single twisted pair cable. The Extron DTP HDMI 330 is a transmitter and receiver set for long distance transmission of HDMI, audio and bidirectional RS-232 and IR signals over a single CATx cable. It provides an effective means for extending HDMI and embedded multi-channel audio from HDMI-equipped devices. IN addition the DTP HDMI 330 accepts analog stereo audio signals and digitizes them for simultaneous transmission over the same twisted pair cable. The compact enclosure sizes and remote power capability make the DTP HDMI 330 ideal for extending HDMI, audio and bidirectional control in space-challenge environments. 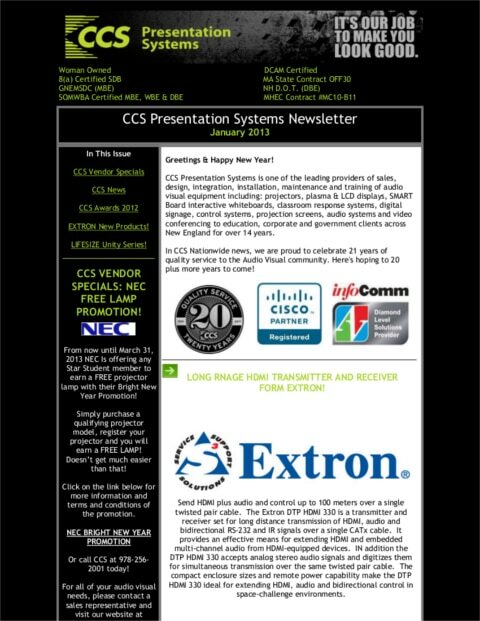 Bankers Turn to iPads in Modernized Boardroom – CCS New England delivers a state-of-the-art, Apple-friendly facility for Federal Home Loan of Boston.